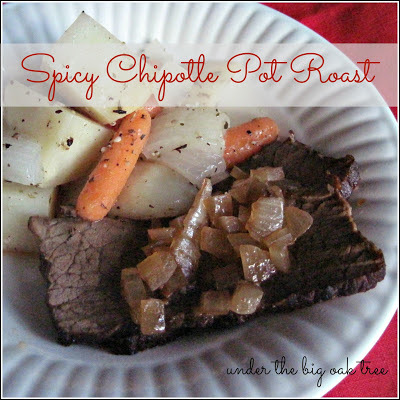 Pot Roast has always been one of my favorite meals. Only when it was prepared by someone other than myself. It seemed that no matter what recipe I followed, it never seemed to turn out right. Even now, this recipe didn't turn out the way it should have....but I was very pleased with the outcome. So much so, that we've enjoyed it quite a few times since first finding this recipe last year. Almost always, when following a recipe, I change this or that to adapt the recipe to fit the tastes of my family. In this case, the recipe sounded perfect for us, so I followed it as written....and just as I thought, it was perfect! As I stated above, the recipe didn't turn out exactly as planned. It was supposed to be shredded beef...but when the cooking time was over, it just wouldn't shred. But it sliced down perfectly and made fabulous roast beef sandwiches. All the times I've made it since then, we've served it as pot roast, with roasted or steamed veggies on the side.